As per the current PMAY plans, the EMIs on home loans would get reduced significantly. The government will be providing a either 6.5%, 4% or 3% interest rate subsidy for each of the houses under this project which is why the EMIs paid would be reduced. This is done by keeping the lower income groups in mind and especially for rehabilitating those who are currently slum dwellers. By allowing a 6.5% interest rate, the Government is giving each house a subsidy of 1 lakh which can go up to 2.3 lakh. 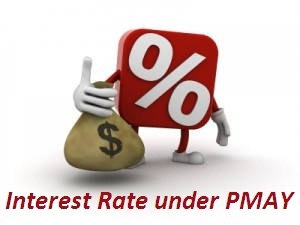 The PMAY scheme is the only scheme that is providing such high interest rate – previously the other schemes had 1% interest rate. The housing loans can under this system can be paid off within flexible years (it can go up to 15 years). The total central grant under this tenure will add up to Rs. 1-2.3 lakh. Why will this be beneficial for users? This will be beneficial for the target groups because at present the interest rates for the housing loans are 10.5% – this clearly means that the government is giving a 4% less interest rate on the housing loans. This will be a major relief for all the applicants. The central grant of Rs 1 lakh will be given to each beneficiary. Such grants were previously not given under the housing schemes. This Rs. 1 lakh will be given by the state governments to the local residents who do not own any pucca house under their own name. How will this be provided? It must be noted that the 6.5% interest rate will be provided to the beneficiaries via a credit linked subsidy scheme. If the beneficiary is a poor urban settlement dweller and qualifies all the criteria of the EWS and LIG groups then he or she will be provided an assistance of Rs 1.5 lakh from the government. This amount can be used to build new settlement or to improve their current settlement. The government will be providing a 6.5% interest rate subsidy for each of the houses under this project which is why the EMIs paid would be reduced. I need home loan to build my Pucca house so I need ur help.